WEAMEC - What is WEAMEC, the MRE ecosystem of "Pays de la Loire"
The WEAMEC combines more than 30 institutes and labs with major players such as Centrale Nantes, the Nantes University, the “Jules Verne Research Institute” or CEA Tech, for example. The WEAMEC was founded by the Centrale Nantes and its main partners: the University of Nantes, the EMC2 competitiveness cluster, and the Jules Verne Institute of Research and Technology. It also benefits from the support of the Regional Council of the Pays de la Loire, the ERDF (European Regional Development Fund), Nantes Métropole, and the CARENE (Saint-Nazaire and Estuary Regional Urban Community). Another strength of the WEAMEC ecosystem is the addition of substantial, unique, internationally renowned tests facilities for MRE Research and Development. Some of them are mainly dedicated to MRE and more generally to marine studies, like SEMREV, a Multi MRE technology Offshore Test Site, completed by wave tank equipped with wind, and towing tanks operated by Centrale Nantes. At the initiative of the Regional Council of the Pays de la Loire, academic and industrial actors in the fields of research, training and innovation worked to define a common strategy for structuring and further developing the dynamics of the regional MRE sector. WEAMEC and its partners have a Research & Innovation roadmap. The WEAMEC is positioned at every stage of the MRE cycle, from preliminary studies to the management and operation of wind farms. 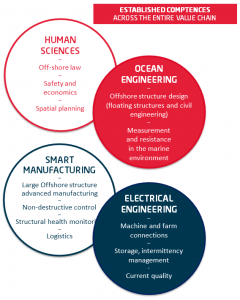 Our main competences are ocean engineering, advanced manufacturing, Structural Heath Monitoring, Electrical engineering, Human sciences on the entire value chain from research to offshore exploitation. 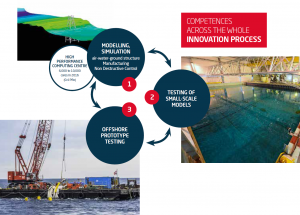 The WEAMEC partners’ competences cover the whole innovation process, from conception and simulation, through tests on reduced scale prototype, up to real sea tests on SEMREV. WEAMEC also takes an active role in the innovation process thanks to partnerships with three clusters: founding partner EMC2, Pôle Mer Bretagne Atlantique, and S2E2. Their respective and complementary expertise in innovative manufacturing methods, ocean engineering and electrical engineering cover the entire value chain. Thanks to these competences and facilities (see below), the WEAMEC partners are currently involved in more than 500 regional, french, european collaborative projects… for more than 100 M€ only for the regional actors over the [2015-2020] period. Beside, a first call for projects organized by WEAMEC helped finance 23 research projects involving regional laboratories in 2016 and 2017. Centrale Nantes and the University of Nantes have created 22 Executive Education modules within the WEAMEC (West Atlantic Marine Energy Community) framework, dealing exclusively with the growing MRE (Marine Renewable Energies) sector. This training provision is intended to give companies and their teams the key to understanding the overall environment of Marine Renewable Energies and how to fit into the emerging MRE market. They will have a comprehensive overview, understand concepts and vocabulary, be able to position the different actors, and finally to identify and understand the implications of their products on the value chain and consider their potential integration into technological components. One to three-day modules put together and delivered by a teaching team composed of academics and industry. The modules have been tailored to meet two objectives: firstly, to expand company activity or help companies to enter this new market and secondly, to develop the trainees’ skills and employability. A new project, an important stage, an event organized by your structure?